Info "The robot is not going to make itself!" Assembly Flyin' is one of Mona's microgames from WarioWare: Twisted! The player has to make a robot using three falling pieces. They must do so by moving the robot under the falling pieces. If the player fully assembles the robot, the player wins; however, if the player misses one or two pieces, the game is lost. 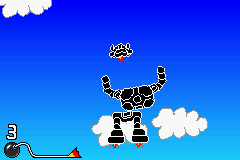 1st level difficulty: The robot is big. The player can see a V when they finish assembling. 2nd level difficulty: The robot is a bit smaller than the first one. The player can see a U when they finish assembling. 3rd level difficulty: The robot is very small. The player can see a A when they finish assembling. This microgame features the same robots as Manic Mechanic, a WarioWare, Inc.: Mega Microgame$! microgame.